These are cute. I designed and made each of these with my own pattern. Yes, I have taken small animals shopping with me while they rode in the fanny pack and no one was the wiser. This one is for Hamsters Lovers and Owners. I will tell you I have made these for my own ratties and hamsters, not only have they been "rat and hamster tested" I am happy to tell you that they love to ride around in them. 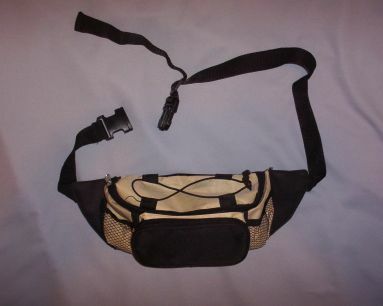 You could also use this Fanny Pack for all the items you want to take with you keeping your hands free. This pack is new and still has the tags on the bag, the color is red. 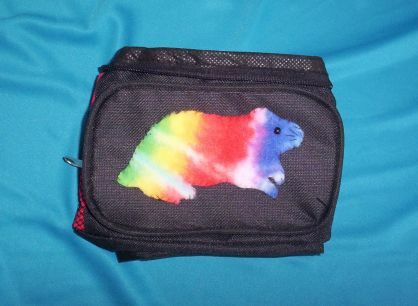 I did not make the bag it self, but designed and cut out the Hamster. The Hamster has a "E" Bead black eye and thread whiskers. The cut out is hand sewn onto the bag. The belt opens quiet large, I am guessing just about anyone could wear this bag. The bag has several pockets and three of them zipper shut. The bags hand washable. You could dry them in the machine or let stand to dry. This bag is new and has never been used. 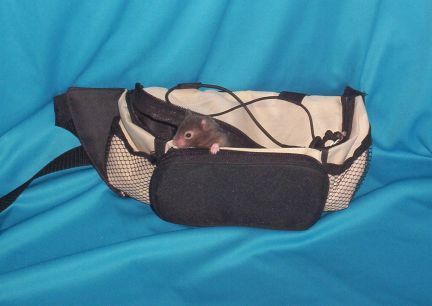 The photo you see of Running Bear, my little hamster, is taken in one of my own bags. Our items are non refundable, they are not returnable. However, if there is a problem with the craftsmanship we are happy to replace the item with one of the same (fabrics may be a bit different). Thanks!